February 19, 2016  This week's military commissions of Guantanamo Bay detainees slogged or ground to a halt when the accused tried to fire their attorneys — again. Then excerpts shown from torture scenes in the film Zero Dark Thirty jolted the staid war court. The trials of some of the detention center's most prominent detainees have no end in sight even as President Obama hopes to close the Guantanamo facility. February 16, 2016  Putting the five men accused of plotting the attacks on trial is a long process. On Tuesday, at Guantanamo Bay, Cuba, another round of seemingly endless pre-trial war court hearings gets underway. February 14, 2016  Military commissions resume this week at Guantanamo, even as President Obama maintains his vow to close the prison, with or without Congress. Fact-Check: Could The Next President Bring Back Waterboarding? February 13, 2016  Ted Cruz said he doesn't consider waterboarding torture, and Donald Trump said he would bring back "worse" methods. We break down whether that would be an option under the law. February 10, 2016  Defense Secretary Ash Carter is convening his counterparts from more than two dozen anti-ISIS coalition partners in Brussels on Thursday. Carter aims to goad them into stepping up their contributions to the war on ISIS. But the meeting coincides with what Sunni Arab partners consider a far greater threat in Syria: a Russian-Iranian-Assad offensive on the verge of recapturing Aleppo from rebels. February 9, 2016  The GOP presidential hopefuls are trading attacks on the use of water boarding and other such harsh interrogation techniques. Donald Trump vows he would revive those techniques as president and has attacked Sen. Ted Cruz for opposing that idea. Many critics and studies, however, conclude that harsh techniques do not work. February 8, 2016  When it comes to launching top-secret military satellites, the Pentagon relies almost entirely on rocket engines made in Russia. The U.S. has been using Russian rocket boosters for the past 2 decades. January 14, 2016  The Pentagon on Thursday transferred 10 detainees from Guantanamo Bay to Oman in the largest single transfer to a single country under the Obama administration. 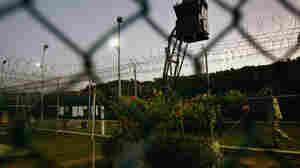 There are also reports 30 more people could be transferred out of the detention center by this summer, and the administration wants to move the balance of the prisoners to the United States. January 12, 2016  Ten U.S. Navy sailors are being detained by Iran after Tehran said they drifted into Iranian waters in the Persian Gulf. The reports came ahead of President Obama's final State of the Union address. Did Obama Achieve Last Year's National Security Commitments? January 12, 2016  How has President Obama done on the national security commitments he made in last year's State of the Union address? With tape from that speech, NPR looks back on some of the president's pledges. January 7, 2016  The White House has ordered the Pentagon to study gun safety in an attempt to field new technologies that make weapons safer. But the military services don't have any desire for safer weapons, and none of the technologies or products that already exist have found any acceptance among gun buyers. January 4, 2016  Guantanamo Bay detainee Mohamedou Slahi wrote the book, Guantanamo Diary, describing what he'd been through. He's in such a legal limbo that he hasn't been able to receive his own copy of the book. Should American Women Have To Register For The Draft? December 17, 2015  The Pentagon has lifted its ban on women in combat jobs, prompting debate in Congress about whether they must register for Selective Service just as men must.